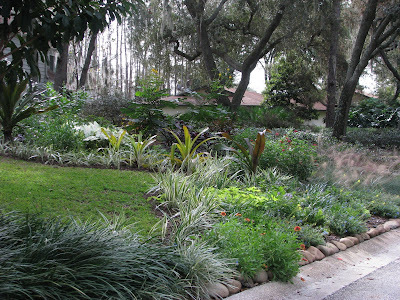 A look over from the driveway to the outer edge of the lawn area reveals the development of the front lawn renovation. Standing in the street facing toward the south neighbors gives the widest view I can get through my lens. 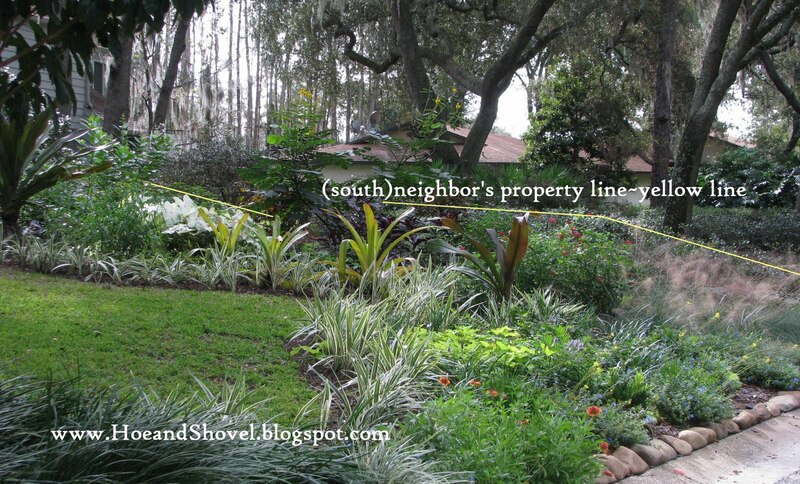 My neighbor's driveway is just on the other side of the yellow line I've drawn ~~ Just for a better idea of how this renovation project wraps around the outer edge of what used to be all lawn grass and flows down (it's a slight slope) into the corner of my front lawn. A little bit of a tighter shot. 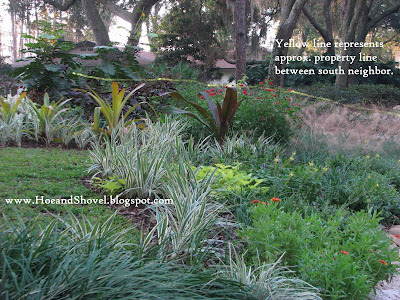 And you can see the Muhlenbergai capillaris Muhly grass is still fuzzing up the farthest corner. An even tighter shot indicates how nicely the chosen plants we started with have filled in and grown together just as we envisioned when initially designing this area. You can go here to read the back story and see it from beginning to end. From the grassy area looking toward the street the pentas, grown from cuttings, have really done their duty drawing in the butterflies that seem to love their tall stature and deep red flowers. Just a reminder of how we looked when first planted out only a short few months ago on July 31. Just one small plant added in September to see if it would grow well here. 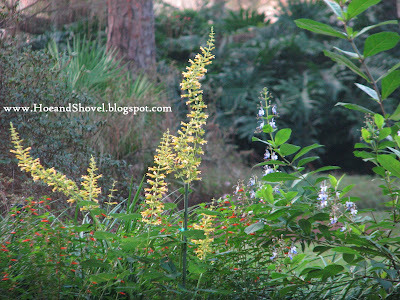 It has not disappointed as it grew very quickly and bloomed right away. 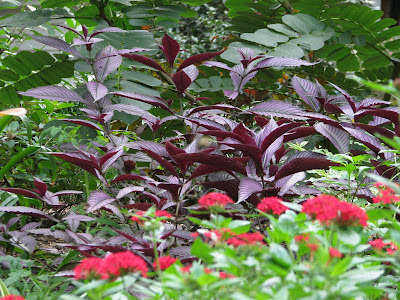 Strobilanthes dyerianus Persian Shield is located in two places. 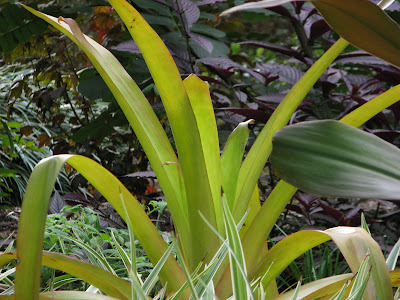 These plants shown on the slope and some younger plants from cuttings (not shown) are sited on the far side of the Giant Crinum Lily. 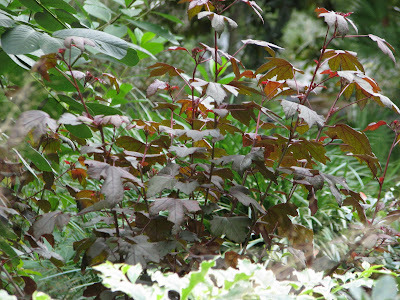 Hibiscus sabdariffa Maple-leaf Hibiscus also grown from cuttings add some of their deep magenta foliage color next to the Cassia Alata. The mostly sunny location of this front corner afforded me the chance to plant some sun loving plants that the rest of my shady garden just won't accommodate. 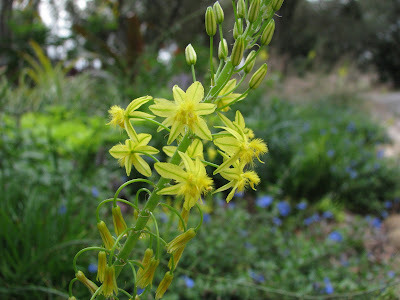 The bulbine has really performed well in the drier, well draining conditions by the street. 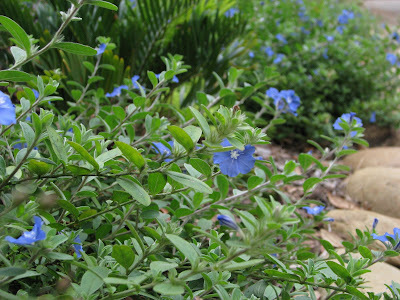 It has bloomed continually and is filling out next to the Evolvulus glomeratus blue daze plants. And... a bird bath to finish off the new area added in late October. 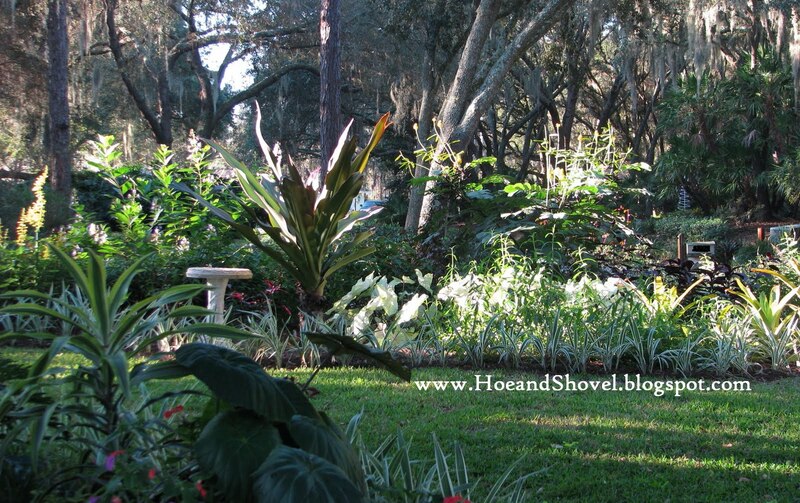 I hope you are enjoying this Christmas season and getting to be in your garden as the weather and time permits. My veggie garden draws me out each day and then there are always more things that call for my attention. We had another nice rain today so no hand watering necessary. AND... we are cooling off again... Yay! basic ingredients of a truly merry Christmas. Don't forget to leave a comment on Day 6 for a chance to win Judy White's newly released book, Bloom-Again Orchids. 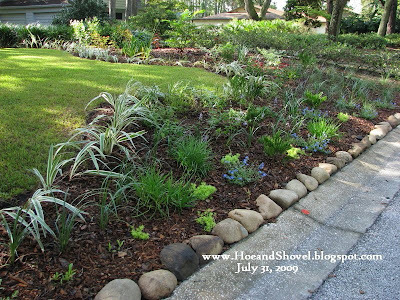 i love how your newly planted front bed looks like it has been there forever. it's beautifully done. Great job on the new beds.I really like the first two pictures with the spanish moss hanging from the trees. I haven't seen that in many years. It reminds me of an older Florida that I remember. It seems amazing to me how fast your new front garden has grown in. Here it would take two years for a new garden to seem so full. Watching your garden grow is like seeing a garden in fast motion. I like the taller plants you have placed about. 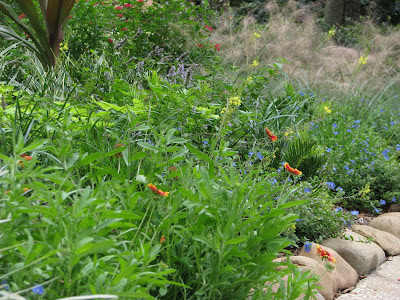 I also like the river rock that lines the bottom of the front planting. Great post. Some of my fav flowers are featured. 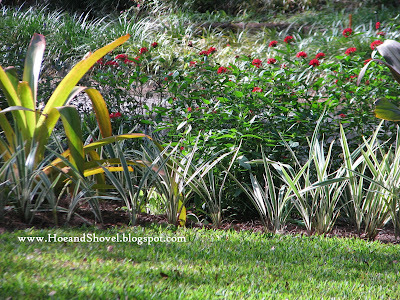 It really doesn't take long for a new bed to look established in Florida. We are, oh so, lucky! It looks stunning and I really like the rocks along the roadway. Not only functional but attractive -- Great idea! The new beds look great! 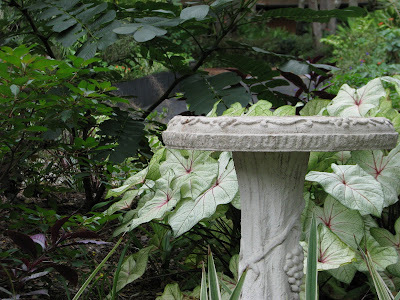 Love the bulbine blossom, I've never seen that flower before.The birdbath with the caladium is a beautiful sight. I finally joined you in posting a picture for this series today. Thanks for starting this...maybe you'll make it an annual tradition. I am admiring your use of grasses and grass-like plants. Do you use lemon grass and vetiver? They are my favs, lemon grass along beds with roses in them and vetiver anywhere a tall grass is desirable. My yellow bulbine died, but the tangerine was a real show this summer.